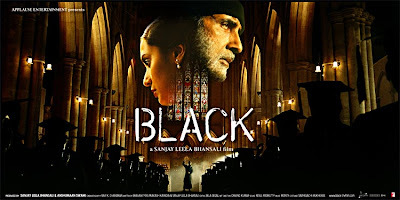 Of all Sanjay Leela Bhansali movies, Black is the most musical and definitely the best. The moment you say, it no more exists - The Silence, but the moment you play it - The Piano, the silence is best expressed. With Piano as voice, Monty has written a simple yet beautiful melody that becomes the word to speak the silence in Michelle's world. And Debraj also gets his turn with the Piano for the silence that later engulfs his world. Monty picks a sympathetic melody on Piano for Debraj but it also gets massive help from Duduk which beautifully evokes the fuzziness that Debraj gets into as he begins to forget everything. Duduk instantly takes us into Debraj's world where there is nothing but blur everywhere, where there is pain which is so deep that it isn't a pain anymore. These are the two themes and instruments that are used throughout the movie to maintain coherent soundscapes for the two principal characters of Black. Black has no typical songs, but not a frame of Black is without background score, which includes the silence that has been deliberately brought in as punctuation, for the orchestra to hit the next highest decibel while playing the Michelle's theme. Every scene that is there to make a poetic point, that is conceived to build up to an emotional high ends with the full throttled orchestral version of the main Michelle theme, which unfortunately made the not so keen listeners to push this complete musical off as a loud score, loud - as loud is in a movie like Ghajini, which is so unfair. This loudness is not always for the sake of loudness, it genuinely helps to elevate the emotions which are already played by the lead characters in the loudest possible way (I don't say that in a derogatory tone). The beauty of black lies in the loudness of its silence. Each time the loud score appears to close a particular episode, it implies the start or punctuates the end of an important episode in Michelle's life. The first time we hear the Michelle’s theme is when we see the now grown up Michelle stretching her hands to the sky welcoming the snow to fall. It is a typical protagonist introduction score playing the main theme in its complete form and sound. Immediately, as Michelle takes us back to her childhood, we hear the just born version of the theme as Mr. McNally informs her wife that their daughter is deaf and blind. Each step Michelle takes, each obstacle she breaks, on the path towards light, the theme is played loud on orchestra, informing us that it indeed is a big step that she has taken. When she completes her first day of school with Debraj, her first set of lessons on words like spoon, napkin, ball, and when finally the miracle happens and even after at every step the theme accompanies her. But the theme doesn’t always shout out in this form for just Michelle, it also turns towards other principal characters in the movie. It becomes Mrs. McNally’s theme when it is played on higher registers of a violin expressing the choking emotions of a mother (and we the audience) as she hears her deaf and blind daughter calling her ‘Ma’ for the first time. It is such an aching yet relieving piece of music that etches the magically captured visuals of a miraculous moment eternal in our mind. In the first half of the movie, when Michelle is still trying to understand the link between world that she is in and the one that she is in touch with, when she doesn’t have a voice of her own, the theme appears mostly on Piano or some other instrument, but once she turns knowledgeable, moves into light, she gets a voice of her own, and that is beautifully reflected in the score too, as Monty uses more of voices in the second half of the movie. It is so evident especially at the conversation between a male voice that emotes at the lowest of the registers (for what goes inside Debraj’s mind) and a female voice that sings at the sweetest of its registers (for what goes through Michelle’s mind), at the climax of the movie where Debraj finally shown to be recollecting the past as he sees Michelle in the graduation robe. The master stroke in this scene is of course the turn of Michelle’s theme to Debraj, when he does signature dance move of Michelle as a sign of joy in seeing her as a graduate. At this juncture, Michelle’s theme becomes Debraj’s theme and Michelle takes Debraj's position as teacher and like Debraj, Michelle teaches the first word 'Woah - W.A.T.E.R' to bring Debraj back into the light of Knowledge. As they both open the doors of the window and stretch their hands out, the most triumphant version of Michelle theme appears for one last time, but this time it is for both Michelle and Debraj, who have done their share of miracle in each others lives. One cannot fill the entire movie score with just two motifs. There are other musical pieces that are composed to match with the actions in specific scenes and are left without being repeated. The main themes do accidentally pass through these pieces. The ‘W.A.T.E.R’ theme is such a deeply moving piece which is heard when Debraj pushes Michelle into the water. It is heard when finally light begins to spark and sneak into the un-flickering darkness of her world. As she spells ‘W.A.T.E.R’ with signs of alphabets, the piano that plays in synch with the rhythm of water drops, the strings, and flute kindle a sense of overwhelm in everyone’s heart. A deep male vocal sings the calm relief as we see in Debraj’s face who gets astounded by seeing at Michelle finally stepping out of her darkness. There are quite a lot of clashing moments as the two eccentrics, Debraj and Michelle, fight to take control over each other and all of them have very loud drumming, turbulent acoustic strings putting up to a beautiful dramatic music to underline the dramatic visuals. ‘50 Steps’ piece is for the funny Chaplin walk of Michelle. It is heard when Debraj asks Michelle to practice walking independently and she ends up walking in the wrong direction. It is a flamboyant piece of music sounding every bit like composed by some European composer, with a dose of Indian sound in Tabla. When Michelle says, ‘Those were happiest days of our lives’, we feel it through such pieces of music being used in that phase of her life. ‘A Ray of Light’ is a collage of a composition that puts together so many little pieces into one seamless symphony to match up with cuts and shifts in the montage where little Michelle comes into Debraj’s control and learns the words spoon, napkin, ball etc., Shot by shot, frame by frame Ravi K.Chandran weaves a visual magic with his mythic and mystic lighting in this montage and keeping up the visual beauty is Monty’s score. I especially like the way the music seamlessly shifts to a brief staccato to underline the funny way in which Michelle lifts the ball as if going to throw on Debraj’s head. And there is more music in the movie and I have touched upon only the highlights here. One fine Sunday evening, I was listening to Black Score, my Mom was sitting next to me having her coffee, as she heard the grand orchestral version of Michelle's theme, she turned and asked me curiously, 'Is this music from Titanic? It sounds so familiar'. She doesn't know a word in Hindi, but she watched Black long back on Home Video with subtitles, and she liked the movie very much. Given that it was difficult for her to watch the movie simultaneously reading the subtitles, background score would be the last thing that she would have consciously paid any attention to. And that pushed me pull this piece. It's a nice score with some touching moments but I have to disagree with one tiny point regarding: "[the loudness] genuinely helps to elevate the emotions which are already played by the lead characters in the loudest possible way". When there is an excess of "loud emotions" on screen, the last thing a composer needs to do is to place emphasis on that very same "loudness" in the music. The audience doesn't need to be assaulted via both senses at (and this is the crucial bit) the same level of intensity. Because the music ends up drawing more attention to itself in an already emotionally-charged scene, it could end up tipping the scene over into parody - obviously it's never a good thing and restraint is one of the fundamentals of film scoring technique. scorelover (nice name) - Yes, I know that someone would say this to me about the loudness factor and that is why I drew in comparison to loudness as in Ghajini. Loudness here is not the volume in which a character speaks, loudness in the visuals of Black is of different kind. I wish Monty was given a better orchestra to work with. Conceptually and compositionally, the score is world class. But the execution could have been better. The strings sound too thin and piercing in places, and a real duduk could have been used instead of a sampled one. The synthetic textures, on the other hand, have been handled brilliantly. It's definitely one of the best (and unique) scores I've ever heard. Ishaan - Thanks. I guess Duduk is original and I feel it is difficult to reproduce that windy sound of duduk by soundfonts.. Thank you Mr. Suresh Kumar for your beautiful blog. I have never heard such an incredible soundtrack. Brillant, marvellous! Thank you for bringing us this unique music. Excuse me for my poor english. I am spanish and I love indian music.